If you lived anywhere in Southern Ontario or were paying attention online last night, you’ll likely know that the Toronto area experienced a brief but violent storm early yesterday evening. What made Torontonians sit up and notice was the dozen or so tornado warnings issued for the area as the storm rolled in. For a while, the words “Toronto” and “Tornado” trended on Twitter as people relayed news and their tales of the storms. Jim Parsons also has several fantastic photos. As weather stations forecast the storm earlier in the day, there was a brief spike in conversation in the morning. Conversation related to the tornadoes themselves began to erupt around 6pm – the first time that, had you been paying attention to conversation trends, you would have noticed a trend evolving. Another noticeable feature is the second spike in conversation later in the evening. The storm was well away from Toronto by this point; this spike represented people discussing their experiences and posting photos and videos they had collected during the episode. Once the storm began, the velocity of the spike in conversations was significant. We saw an immediate 66% increase in the volume of conversations about Toronto; at the height of the conversation (once the storm had passed, funnily enough), the volume represented more than a 125% increase in the converastion about Toronto. Meanwhile, from one or two posts an hour about Toronto and storms or tornadoes, we saw an increase to roughly one post per minute during the storm, and two posts per minute in the aftermath. 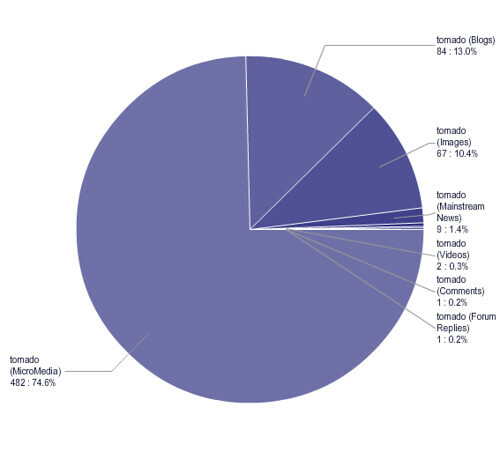 Not surprisingly, with Twitter being the golden child of the moment, especially for time-sensitive updates, micromedia comprised almost three-quarters of the conversation relating to tornadoes. Blogs made up 13 per cent, while images captured by people comprised 10 per cent of the conversation. This is a substantial departure from the day as a while, during which nearly 40 per cent of the conversation about Toronto occured on blogs and a similar amount occurred on Twitter. A useful reminder that while Twitter is high-profile, on a day-to-day basis much conversation happens elsewhere. Putting the storm into perspective over the course of the day gives an interesting slant to things. While it’s headline news today and was during the night, mentions of the storm and of tornadoes comprise a small segment of the conversations regarding Toronto yesterday. Despite the storm, discussion around the Jays/Sox game garnered almost as much overall discussion. What are your memories of the storm? Does Social Media Make PR Agencies Obsolete?